This story first ran in The Cedar Rapids Gazette on July 14, 2017, and can be found here. CEDAR RAPIDS, IOWA — Desmond King stood on the sidelines of the Metro Youth Football Fields in Cedar Rapids on Friday afternoon with a half circle of people around him. No, he wasn’t surrounded by reporters at a news conference. He was surrounded by kids. The former Hawkeye was coaching at the Iowa Football Club “Legends of Iowa” camp, and was fielding questions. “Can you try to sack Tom Brady this year?” one kid asked. “Are you going to be on the new Madden?” another fired off. This continued for a few minutes, with King answering questions left and right, before a whistle in the distance sounded. Suddenly, the kids were right back to work. 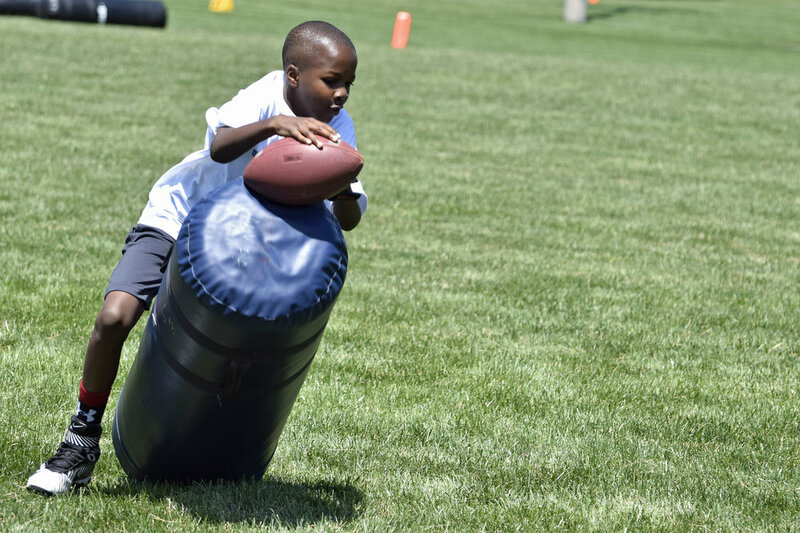 King was one of four Hawkeyes from last year’s team, and dozens of former Hawkeyes and NFL players coaching at the one-day camp, all attempting to share their knowledge and help Eastern Iowa kids get a little better at the game they all love. The camp is split up in to two groups. The first group is for kids going into grades 5-10 this fall, and went all day long. The second group is a half day group, meant for kids going into grades 1-4. The kids are split up into teams and position groups. They run through numerous drills, both on offense and defense and play a handful of 7-on-7 games at the end. King, who is back in town while on break before reporting to training camp with the San Diego Chargers later this month, said the biggest thing he can give these kids is simply knowledge. Getting the younger guys to come coach, camp director and Iowa Football Club President Jim Molini said, is really what makes the biggest difference for the kids. After all, they are who the campers recognize the most. Kittle remembers attending a football camp as a kid and seeing Bob Sanders, his favorite player at the time, return to camp and speak. As a young kid, that was easily the highlight of his camp experience. Kittle, who is currently playing with the San Francisco 49ers, said he hopes to give off whatever knowledge and tips he can to the kids at camp, and while he’s in the area. Above all, though, he’s just here to have fun with the campers.